Hi, I’m Lori. I’m the “girl” in Girl Meets Oven. If you are here, you probably want to know a little about me. The idea of making something from “scratch” was a foreign concept. But sharing funny stories was a common occurrence. Then one day, I met my husband, Ken, and his family, who shared their family recipes and own funny stories (none of which involved the fire department). I decided to start cooking some recipes and stories of my own. There were a lot of trials and errors along the way. I still remember reading Ken’s grandmother’s apple pie recipe for the first time, and discovering the first step was “make pie crust.” It didn’t even explain how to make a pie crust. I was in way over my head. My early encounters baking became the inspiration for this blog. I still have a lot to learn, and want to learn more by swapping stories about baking with others. So the idea with Girl Meets Oven is to share some fun stories while learning about baking, with others who love baking, from kitchens across the Internet. I’d love to hear your story. How did you get your start baking? What are some of your early memories in the kitchen? 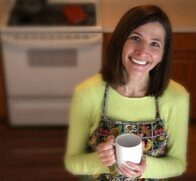 I am enjoying your site, the new recipes and stories. Ken, the pictures are amazing. Hey, I recognize your apron. Lori; so funny! I was raised in a home where potatoes wrapped in foil every morning and put in the pre timed oven for dinner; canned vegetables EVERY night, half a loaf of bread and some quick fry pork chops or steak; were an everyday meal. I met my oven when I met my husband as well; he requested we have chicken and potatoes for dinner…. I had no idea! I looked up ” how to cook a potato” in the cook book ( as there was no internet yet) and boiled the boneless skinless chicken breast in a frying pan of water with pepper and butter in it. I boiled it because I was worried that it would burn if I fried it till it was cooked and if I didn’t burn it, it wouldn’t be cooked all the way through…. all those were the days:) I can now say ( 13 years later) that I LOVE Cooking, baking and trying new recipes every week! I look forward to reading your blog. Thank you so much for your nice note! Glad you like the blog. It’s so fun to meet someone else who also met their oven and husband around the same time. Your story about cooking potatoes and chicken for the first time brings back so many of my own memories of learning how to cook. We had those instant mashed potato flakes from a box when I was a kid.